It’s fairly common knowledge that tuna is high in methylmercury, a neurotoxin that bioaccumulates in marine food webs. This means that methylmercury magnifies further up the food web – tuna eat smaller fish that eat even smaller fish or plankton — all of which could contain the contaminant. Methylmercury is highly toxic and has negative developmental and health effects, including intellectual disabilities for babies exposed in utero. This is why pregnant women are advised not to eat sushi. Seafood consumption is responsible for 80% to 90% of organic mercury in the human body. Human activities, such as coal burning and gold mining, are the main cause for increasing levels of methylmercury in the ocean. 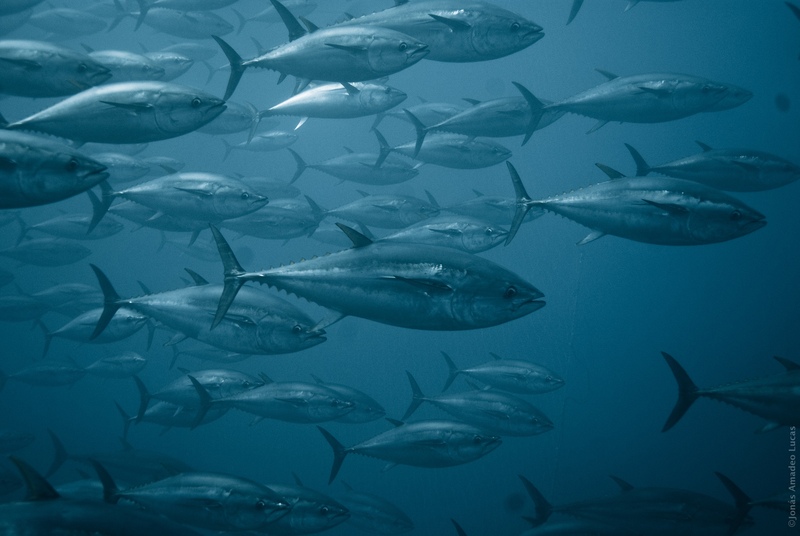 Methylmercury is only one of the bioaccumulative toxic substances in tuna, so tuna consumers should want to know how polluted their seafood of choice is. It’s becoming more and more clear, however, that the answer to “How polluted is my tuna?” is a tough one to pin a single answer to, especially in light of research that shows that tuna caught in different locations have very different concentrations of toxic pollutants (See “Geographic Differences in Persistent Organic Pollutant Levels of Yellowfin Tuna” and “Mercury levels of yellowfin tuna (Thunnus albacares) are associated with capture location”). Many things contribute to how much of a bioaccumulative pollutant we will find in a single fish. Using the example of methylmercury, we can start with the local concentration in the seawater. The more methylmercury in the water, the more that can be taken up into the food webs. Seawater methylmercury likely varies a lot in different regions of the world, both because there are areas where mercury can be more easily converted into toxic methylmercury by ocean microbes and because there are areas where more mercury makes it into the water from nearby sources. Secondly, there is the methylmercury uptake that happens at the base of the marine food web, which is a conglomeration of plankton microorganisms that are the photosynthesizers of the sea. The composition of this plankton community has an effect on the amount of methylmercury that makes it into the food web from the seawater, and the composition depends on environmental factors such as light and nutrient abundance which are very different across the globe. Photo by Taylor Grote on Unsplash. Once the methylmercury is in the food web, it bioaccumulates because the fish take it in through their diets faster than they eliminate it from their bodies. Different species of fish have different mercury levels relative to their neighbor fish, and from the point of view of a tuna, the type of prey species they eat will matter for their methylmercury concentrations (although they obviously don’t know this). By analyzing tuna stomach contents, it’s been found that tuna of the same species in different regions of the world’s oceans have very different diets. These diet differences mean that in areas where tuna are eating higher-mercury food, they will therefore themselves have higher mercury concentrations, all else being equal. If you could account for all of these differences in tuna pollution based on where they’re caught, it could still be difficult as a consumer to choose your tuna truly wisely. Even knowing country of origin, which is maybe the most information you should expect about commercially distributed tuna, could still leave a lot of wiggle room in polluted-ness. Many countries fish tuna across a large area of the ocean, and even coastal areas within sight of a single country’s shores can see big pollution differences if the country is large enough. 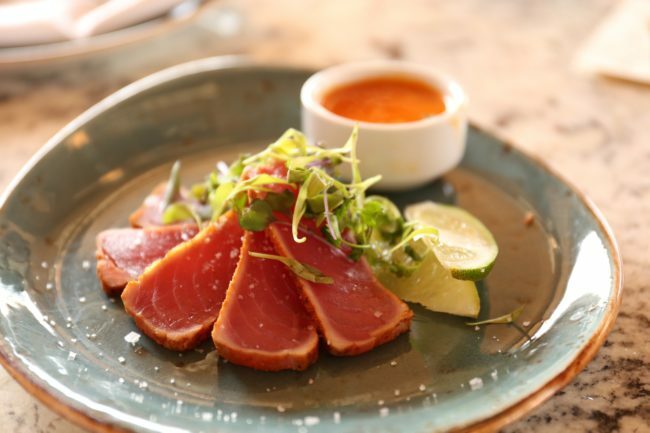 If you’re really worried about toxics in tuna, moderate your consumption by substituting fish that have lower pollutant concentrations. Colin Thackray is a postdoctoral fellow at Harvard University, with a background in numerical modeling of atmospheric physics and chemistry. He is developing a modeling framework to trace anthropogenic emissions (to the atmosphere and oceans) of toxicants such as mercury through the physical environment into marine food webs to assess the toxicants’ effects on fisheries health and sustainability. This framework will also help project future fisheries sustainability under changing fishing/climate/emissions.